Yes, yes, yes. 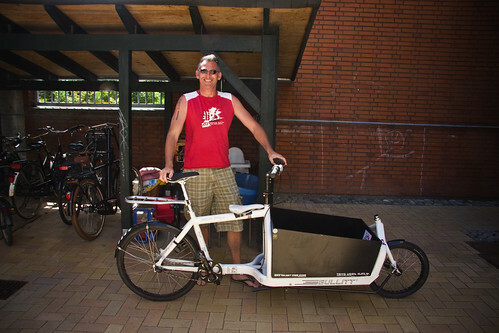 We all know I like my cargo bike. And that I'm happy to blog about it. Especially now that I have a new red Bullitt. I couldn't resist this shot the other day. I rode past a Ferrari and thought I'd take a photo of the 21st Century version. 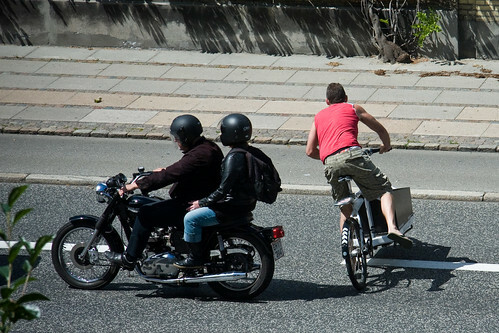 Urban Manpower for Liveable Cities vs Horsepower for the sake of Horsepower. I love Larry vs Harry's new foldable racing seat on which the kids sit, and the new custom side panels. 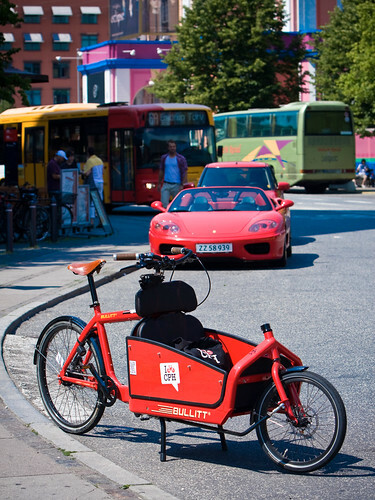 I sold my white Bullitt to Mads, who runs Ekeko.dk - a sustainable development company that imports clothes from Bolivia. So the bicycle went to a great home. There is goes. Just a metal construction with some rubber bits, but one that has served me well. And the latest text message from Mads reveals that he loves the bike. 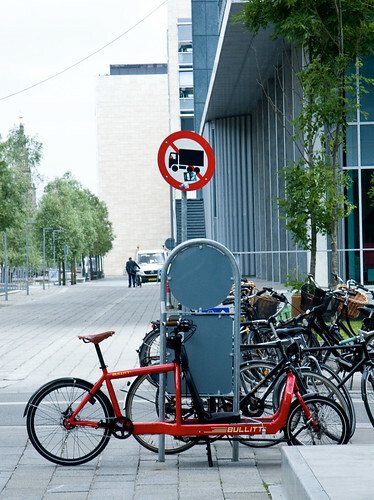 A 'No Trucks' sign with an alternative in front makes much more sense. It really is quite cool riding around the city on this bicycle. In the course of a day I'll end up talking to 5 or 10 people about it. From teenagers to elderly ladies. At stoplights or outside shops. I've never had a bicycle that generates so much conversation.